Zhemgang dzong stands on top of a ridge that rises sharply from the Mangdechhu, facing the village of Trong and Zhemgang town. It was founded by Lama Zhang Dorje Drakpa who came to Bhutan from Tibet in the 12th century. Lama Zhang is considered the greatest Buddhist saint to settle at present day Zhemgang. 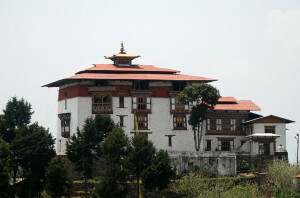 In 1655, where he had built a hermitage, a small dzong was constructed to symbolize the unification of the three Kheng divisions. In 1963, when Zhemgang became a separate dzongkhag, the dzong was renovated under the Third King.